I like to kick back at the end of the day and have a beer. I am your average dude in that way (among many others). For a long time, in my world, Miller High Life was my beer of choice for this activity. It tastes good, it’s not a heavy beer and best of all — it’s relatively cheap. You can get something like 100 ounces of MHL for roughly six dollars. That’s like Suave shampoo cheap. Thinking of that Jeff Foxworthy bit now. On an unseasonably warm evening in December I was doing my thing, enjoying some streaming video on my television, my wife flanking me to the right of the couch. Full transparency, this was beer #2. I know, I know, don’t fly close to the sun, Jim Morrison! Hahahaha. I know. It’s only rock and roll. So I’m approaching the bottom of the can, and I feel that it’s a little heavier than that weight that you’re used to, at the bottom of a can. We all subconsciously know when something feels weird. Somethin’ ain’t right. On this night, I guess I was determined to finish this beer, so I rationalized the abnormality and assumed it was an extra foamy bottom. ‘PROCEED WITH THE SIPPIN’!’ I screamed aloud, startling Megan. I didn’t actually do that, but I thought it. I’m pretty sure. I did. Immediately horrified and in a bit of a panic, I look up any kind of contact information I can. This felt like betrayal. I thought we were friends, MHL. I guess you’re flirting with my wife behind my back, too? I decide to go straight through social media, because these days companies have decided you have to take a survey essentially before you can call them. I wrote them a message on Facebook that looks similar to what I just told you before. Apparently I was watching Star Wars. I called Miller FOUR TIMES over the course of the next 24 hours and waited on hold each time for varying amounts of time, up to 30 minutes. That’s a long time to tie your day up. At some point (and I checked with people to make sure I wasn’t being crazy), I think the onus switches to the company that produced a product with roaches inside it. I think I made a valiant effort to contact them. 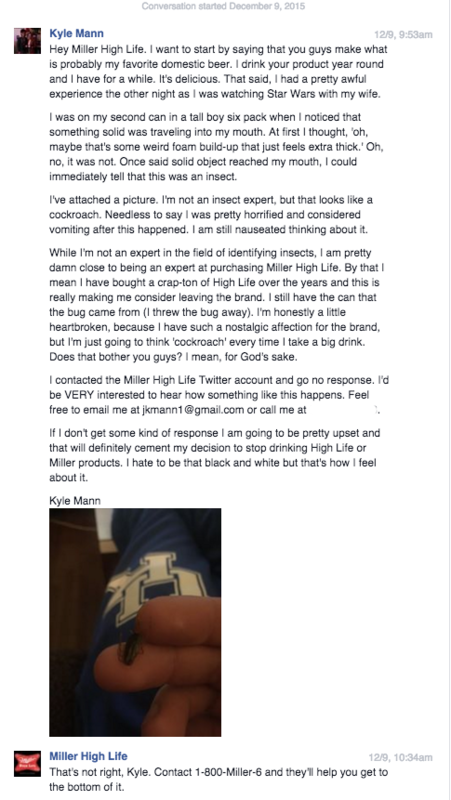 For the record, I still have not heard back from Miller High Life or the Miller company. There were two roaches in one of your beers. You lost a customer, and, most every person I’ve told about this story has said the same. Thanks for the lesson in customer service. Please spend all the money I gave Miller wisely. I might suggest a pest control visit.